Hines’ 609 Main at Texas tower. HOUSTON – (Realty News Report) – Simmons & Company International | Energy Specialists of Piper Jaffray leased 31,000 SF at 609 Main at Texas, the new 48-story office tower developed by Hines in downtown Houston. Simmons, an investment banking and financial advisory firm, will move into the 1,073,075-SF building this fall. Michael Anderson and Damon Thames with Colvill Office Properties represented Hines in the lease negotiations. Lou Cushman and Tim Relyea of Cushman & Wakefield represented Simmons. With this lease, 609 Main at Texas stands at over 64 percent leased. Other notable tenants include Kirkland & Ellis LLP, Orrick, Hogan Lovells, McKinsey & Company, Russell Reynolds Associates, and United Airlines. 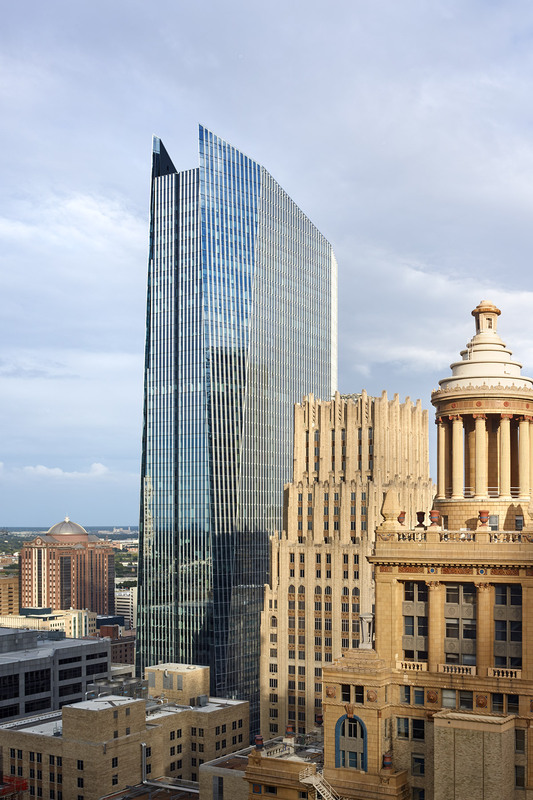 The 609 Main at Texas building, designed by the Pickard Chilton architectural firm is topped with a diagonal crown that has become a new downtown landmark. The property is pre-registered LEED, and is expected to attain LEED Platinum in the coming weeks. Amenities at the vertically integrated campus include a “hotel-style” lobby with a café and spaces for networking; a 7,000-SF fitness center and 8,000-SF conference center; full-height windows allowing for an abundance of natural light; an underfloor HVAC system; and private roof gardens. “It was important to us that we selected a flagship building offering the top amenities for not only our clients but also our employees,” said Simmons Managing Director and Co-head of Energy Investment Banking Fred Charlton.